For SUVs and off-road vehicles. The Touring Club Schweiz (Swiss Touring Club) tested various summer tires of the size 175/65 R 14 T.
Rating for the Conti 4x4 Contact: "Highly recommended"
’Autozeitung’ (11/2005) tested the size 255/55 R 18 V.
"Best of all the V-tires. The well-proven Conti4x4Contact scores points in all disciplines with its sound performance." Stiftung Warentest 4/2004 tested the size 215/65 R 16 H.
ADAC motorwelt 4/2004 tested the dimension 215/65 R 16 H.
The testers' verdict: " well-balanced, comfortable tire, best results on dry and wet surfaces, lowest exterior noise "
AUTO BILD alles allrad tested 5 all year round road tires and 1 road/off-road tire of the size 215/65 R 15 H.
Strengths: High-performance in all areas, with excellent handling characteristics on wet and dry surfaces, the shortest braking distance on wet surfaces. Excellent noise levels and comfort in on-road use. The tire, specifically designed for SUV vehicles, ensures a particularly quiet and comfortable ride on normal roads. The tread grooves protect against aquaplaning. Superb traction both on- and off-road. 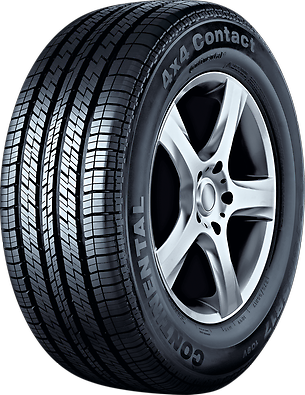 The tire provides improved traction both on the road and in moderate off-road use.